Apple has released watchOS 5.1.1 just days after suspending the rollout of watchOS 5.1. The last update had reportedly “bricked” several Apple Watch Series 4 units after failing to successfully complete its installation. 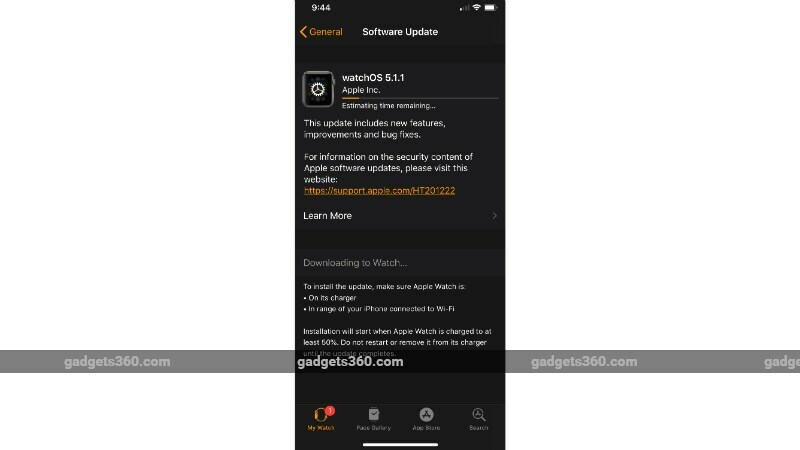 The company hasn’t revealed any fixes related to the bricking issue, though the official changelog says that the watchOS 5.1.1 update includes new features, improvements, and bug fixes. It also highlights all the new improvements and bug fixes that are a part of the latest update. The new version is compatible with Apple Watch Series 1 and later models. As per the official changelog, watchOS 5.1.1 brings new features, improvements, and bug fixes. Apple, however, hasn’t mentioned a fix for the issue that had reportedly bricked several Apple Watch Series 4 units after failing to successfully complete the installation of watchOS 5.1. According to some user reports on Reddit and Twitter that emerged last week, several Apple Watch Series 4 units got stuck on the Apple logo after beginning the process to install the watchOS 5.1 update. The company had acknowledged the issue in a media statement and confirmed the suspension of the affected update. “Due to a small number of Apple Watch customers experiencing an issue while installing watchOS 5.1 today, we’ve pulled back the software update as a precaution. Any customers impacted should contact AppleCare, but no action is required if the update installed successfully. We are working on a fix for an upcoming software update,” the company had said. The maintenance points of the watchOS 5.1.1 update are the same as the original watchOS 5.1. The update includes an improvement to fall detection alerts as well as fixes known Walkie-Talkie issue. It also addresses an issue related to Activity rewards to accurately show rewards through the Awards tab of the Activity app. You can check the availability of the watchOS 5.1.1 update by going to the Apple Watch app on your iOS device and visiting General > Software Update. The Watch needs to have at least 50 percent of the battery charge to enable the installation process. Also, it is recommended to keep it on the charging dock while installing the new update. Your iPhone will also need to be in close proximity to the Apple Watch and will need to be on Wi-Fi. The Apple Watch should restart twice before the update is completely installed, and you need to enter the Watch passcode if prompted, after beginning the update and then follow the prompts from your iPhone.